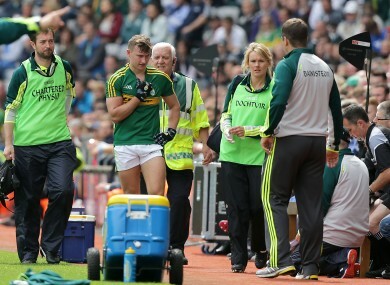 James O'Donoghue pictured coming off injured in Croke Park last August. KERRY FORWARD JAMES O’Donoghue is on course to make his 2016 inter-county debut in the Munster football final on 3 July. O’Donoghue last played for Kerry in last September’s All-Ireland final defeat to Dublin. He then focused on a club championship campaign that culminated with Killarney Legion losing a Kerry senior final replay to South Kerry last November. O’Donoghue subsequently underwent surgery to rectify a shoulder problem and has been sidelined for the 2016 campaign to date. But Eamonn Fitzmaurice confirmed last night that O’Donoghue is back in contention for selection. “James is back, full steam ahead, he’s good. He wasn’t ready for the first (Munster championship) game and he’s played a couple of club games since. “He’s trained with us and he’s in contention now yeah. This was the plan all along, we were just hoping he’d be a couple of weeks earlier. Alan Fitzgerald has been ruled out with a back injury while Brendan O’Sullivan and Denis Daly continue to be long term absentees. Otherwise Kerry are picking from a full squad with Aidan O’Mahony having returned from suspension. Email “We could see the 2014 Footballer of the Year back in action in the Munster final”. Feedback on “We could see the 2014 Footballer of the Year back in action in the Munster final”.